In Japan if you purchase an advance ticket to a movie you receive a premium of some type. 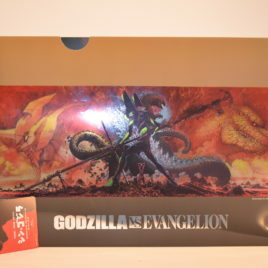 For the new Godzilla movie which opens on July 29th 2016 you get a clear file for carrying paper with a colorful Godzilla vs Evangelion illustration by Mahiro Maeda. 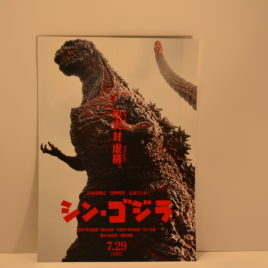 In addition you get the ticket which is good for one showing in any Toho movie theater in Japan showing Shin Godzilla. 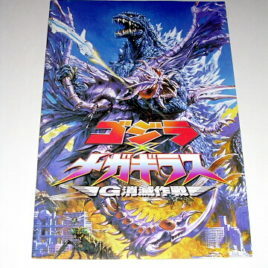 The latest version of the advance mini poster (chirashi) for the first Japanese Godzilla Movie in Twelve Years! 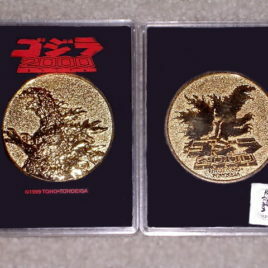 I picked these up on my last trip to Tokyo. Get your own piece of the growing excitement! The measurements on the mini poster are approximately 7" by 10". 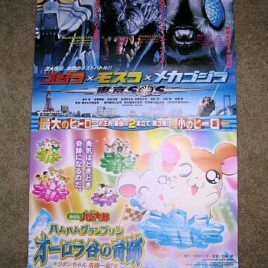 The back of the poster lists the cast (in Japanese). 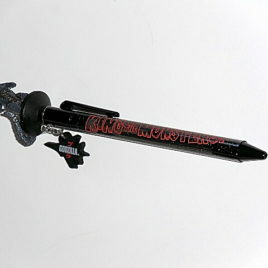 Marmit Heavens Chiller Theater Exclusive FLYING HEDORAH! 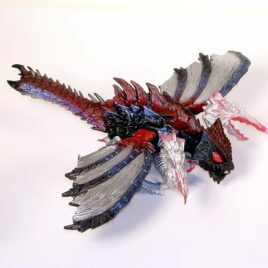 This green, blue, magenta and black FLYING style HEDORAH is IMPRESSIVE!! It measures approx. 9 inches from nose (Hedorah has a nose?) to Tail. GREAT EYES!! Produced in limited numbers (100) for the 2001 Chiller Theater. COMES MINT IN BAG WITH COLORFUL HEADER! 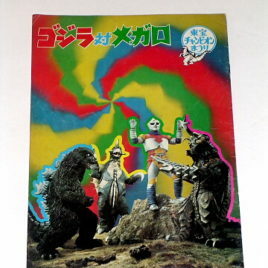 (Header card has premium cut out by Japanese collector) Scroll down to see additional photos. 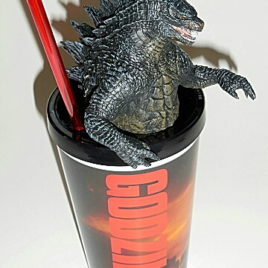 THEATER EXCLUSIVE GODZILLA 2014 MOVIE PROGRAM! 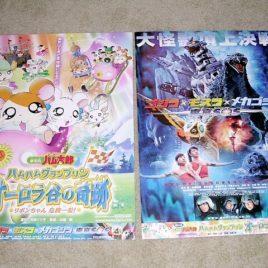 In Japanese theaters they offer movie programs to use as a memory of the event ..special date etc. 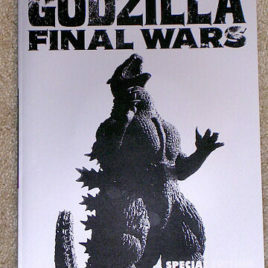 Measuring 11 inches tall and approximately 9 inches wide, this action packed program contains over 60 colorful pages. Behind the scenes shots of cast and crew, action shots from this exciting movie. The last two pages shows all of the toys and theater goodies available.This awesome program will make a great addition to any collection. Scroll down for additional photos. 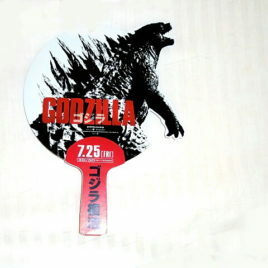 THEATER EXCLUSIVE GODZILLA 2014 JAPANESE HAND FAN! 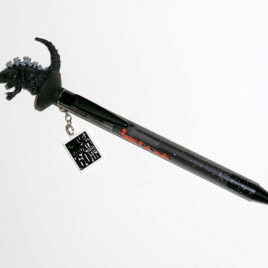 Available at select Toho movie theaters showing THE AWESOME LEGENDARY PICTURES GODZILLA 2014 in Japan, this eclectic and useful Godzilla fan measures approximately 11 by nine inches. 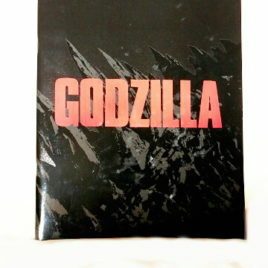 Made of glossy pressed paper, this is a STRIKING bit of GODZILLA 2014. 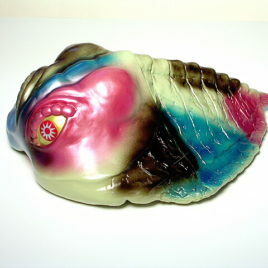 Colorful, this unique item would be a great addition for any collection. 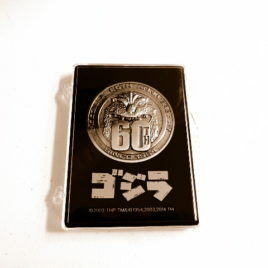 The fan has the Japanese movie release date of 7/25 on the handle. 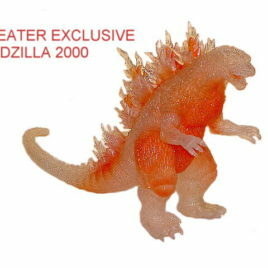 VERY LIMITED STOCK! Scroll down for additional photo. 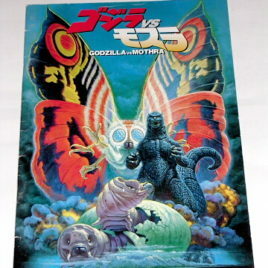 GMK Mothra. 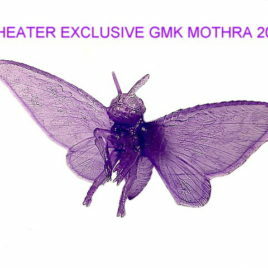 This articulated figure is made of Translucent "Crystal" Purple vinyl impregnated with glitter and has a wing span of approximately 13 inches. 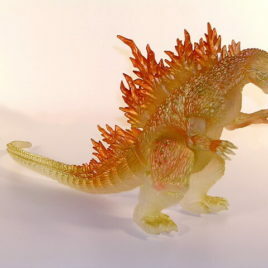 The back legs articulate for posing (standing up on a shelf) COLORFUL!! Comes mint with tag. Guilala STOMPS the G-8 SUMMIT!!! 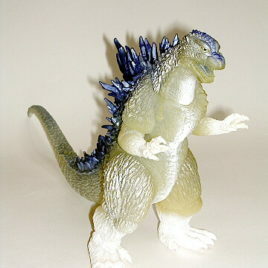 Clawmark Toys gives top kudos to the massive claws on the foot of the X from Outer Space-Guilala Returns! 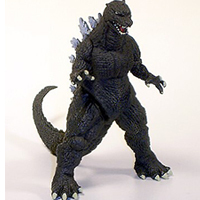 That loveable Monster X from 1967 has been brought back in Guilala Stikes Back/G8 Summit Attack! 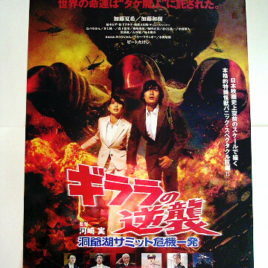 The 2008 movie by Shochiku Company the same Producers of the 1967 movie was written and directed by Minoru Kawaski. He is an independent director with a definite taste for comedy. 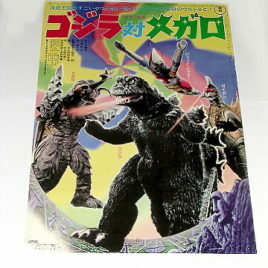 Here is the THEATRICAL POSTER depicting chaos on the ground and in the air as Guilala terrorizes Japan again! The dimensions of this one sheet poster are approximately 20 1/2 by 28 inches. 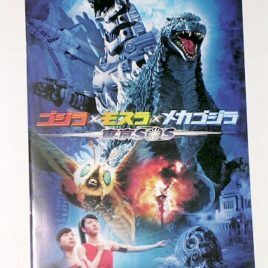 (remember this is a Japanese poster which is metric system) The posters are theatrical release posters in new condition and will be rolled when mailed. 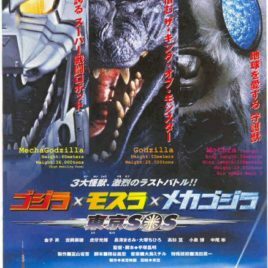 Without giving out too much of the movie story, we can say that it brings a new twist to the Daikaiju Genre. Guilala attacks during the G-8 Summit and the world leaders respond with methods for combat that reflect their cultural beliefs. Kawasaki handles this with hilarious satire. 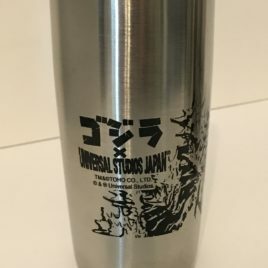 A must have for ALL KAIJU MOVIE LOVERS! 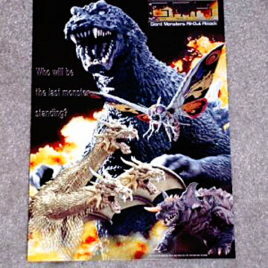 ALL CLAWMARK Toys POSTERS are ORIGINAL no reproductions!!!! !